February 1, 2019 | Contributed by Kate Wood. As Executive Director of LANDMARK WEST! 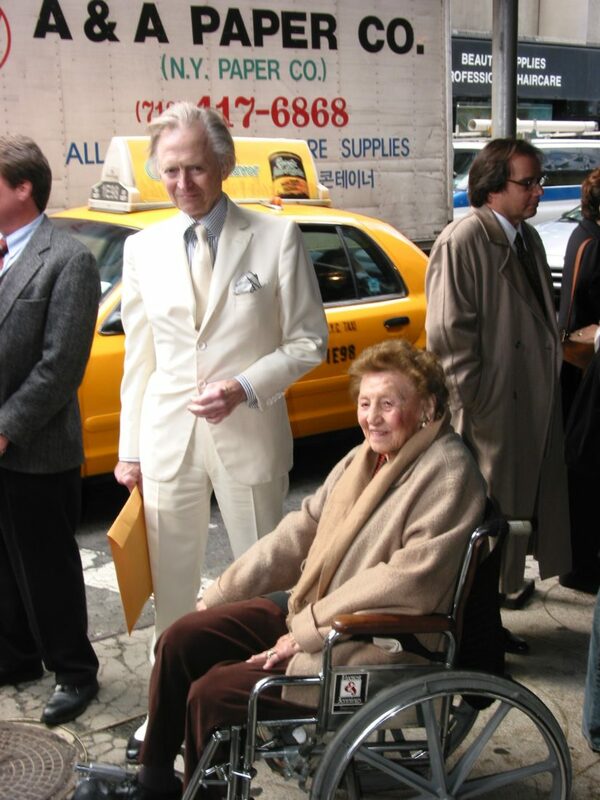 from 2001 to 2012, Wood shared Tom Wolfe’s zeal and commitment to preserving 2 Columbus Circle and the integrity of New York City’s landmarks process. Since author Tom Wolfe passed away on May 14, 2018, preservationists have been reminded of, or in some cases discovered for the first time, his epic Op-Eds, wonderfully titled “The Building That Isn’t There, Parts 1 and 2” (The New York Times, 2003), “The 2 Columbus Circle Game” (New York Magazine, 2005), and “The (Naked) City and the Undead” (The New York Times, 2006). Wolfe—memorably, repeatedly, inimitably—gave the New York City Landmarks Preservation Commission (LPC) a deserved public flogging for its cozy relationships with real-estate developers and the irreversible destruction New York City has faced as a result. Wolfe’s defense of 2 Columbus Circle and its architect, Edward Durrell Stone, began decades earlier in “The Apostates,” Chapter Five of his book From Bauhaus to Our House. In the 1950s and 1960s, the architecture establishment struggled with Stone’s abrupt shift from orthodox Modernism to design that evoked historical and classical motifs. There were legitimate reasons to wrestle with 2 Columbus Circle’s significance when it hit the 30-year eligibility mark for landmark designation in 1994. Wolfe’s voice was a strong factor in keeping the debate alive through what is often a building’s most vulnerable period—when it is technically eligible for protection but not yet considered truly “historic” or important. This debate until lasted until 2006, when the façade was stripped and replaced with terra-cotta and glass. Wolfe also recognized that 2 Columbus Circle represented more than just an abstract architectural debate—and that it was hardly an isolated case. East Side, West Side, all around the town, even conventionally “historic” buildings were being jackhammered with barely a wince from the LPC. Were the commissioners, as Wolfe inquired, “brain dead,” “taking direct orders,” or “in flagrante cahoots” with real-estate lobbyists? Preservationists who dare to challenge the status quo of constant, too often shortsighted change in our city are easy targets for name-callers using the labels of NIMBY, crank, elitist, and worse. When it came to landmarks, Tom Wolfe stood up for the “apostates.” He put the process of saving— and assiduously not saving—New York’s history under his meticulous microscope and then issued a trumpet blast. Best known as an author, Wolfe should also be remembered for one of the other suits he donned—that of the preservationist.